At 10 am, a tractor-trolley snake through neatly carpeted narrow roads in Gulmarg, Kashmir’s winter tourism destination, leaving behind a trail of stench, and garbage. This door-to-door garbage truck makes at least ten dashes daily to a make-shift dumping site, located on the edge of a once virgin forest, on Gulmarg’s outer end. 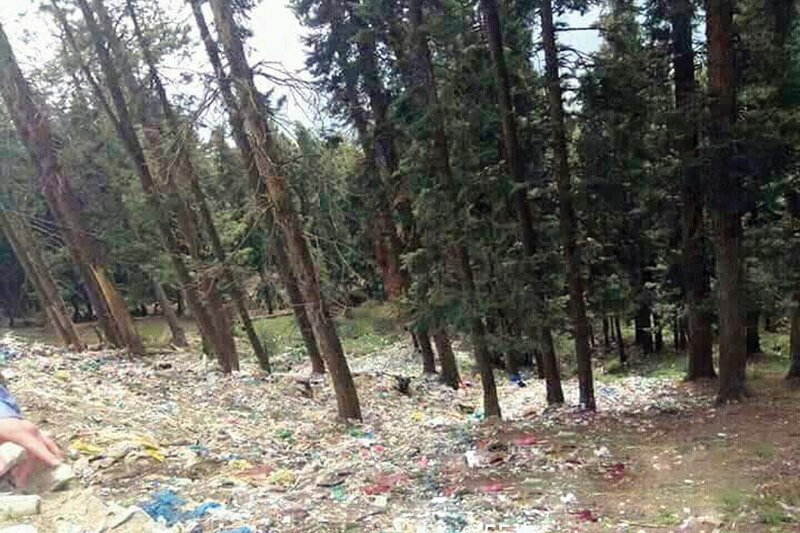 During peak tourism season, Gulmarg generates around five tonnes of waste daily, which gets dumped mostly in the forests. “This includes the waste generated by the army as well,” said Anees Choudhary, Executive Officer, Municipal Committee, Tangmarg. In September 2017, 136 truckloads of waste were taken to Achen dumping site in Srinagar for disposal, after High Court rapped the authorities for disposing of the waste in the forests. A few months back, an old slaughterhouse, constructed on the forest land, was dismantled to pave way for a modern waste disposal site exclusively for Gulmarg. Officials maintain that the foundation of the facility is ready, but it will take a few more months before the site could be used for dumping. “We have placed an order for procurement of solid waste disposal equipment from outside Kashmir. It will take some time to reach here,” said Majeed. But with season’s first snowfall, the inability of GDA to keep Gulmarg clean gets buried under a carpet of white, leaving behind just a mysterious stench for visitors to bear. Lone gets agitated seeing people throwing plastic bottles and polythene wrappers from their moving vehicles. “We need to find quick answers if we have to save our paradise,” said Lone with a hint of helplessness in his voice. The answer perhaps lies in waste management model adopted by little known Manasbal Development Authority (MDA), deep inside Sonawari belt. Located some 30 kilometres from Srinagar, Manasbal Lake is surrounded by three villages: Jarokbal, Kondabal and Ganderbal. “Since Manasbal is a small tourist destination with almost no hotels around, most of the solid waste is in form of what we de-weed from the lake,” said Zulfikar Mohammad Khan, CO, Manasbal Development Authority. MDA has outsourced the management of sanitation waste to a private player. There are seven villages around the lake who collectively generate around 1400 kgs of solid waste in a week. “We have distributed dustbins of 25 kg, 40kg and 100 kg capacity to these households,” said Khan. A garbage truck comes thrice a week to collect these dustbins. In the second stage, polythene is to separate from the waste material. The remaining waste is sent to Safapora, where a government-designated piece of land serves as a dumping site. “There, the solid waste is decomposed and turned into manure,” said Khan. 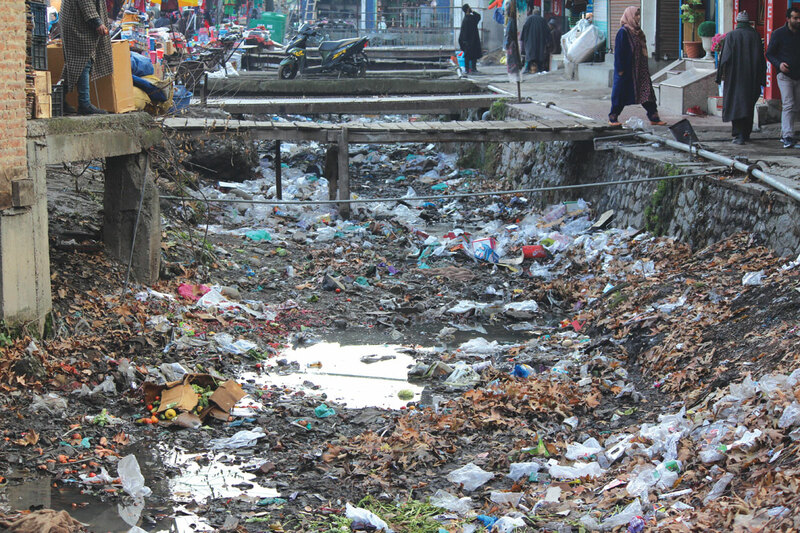 Around 100-km south of Srinagar, the most visited tourist hotspot Pahalgam struggles to stay clean as the footfall of visitor’s peak during summers. As one enters the municipal boundaries of Pahalgam, a strong stench greets the visitors, which almost follows them everywhere. A few kilometres short of Pahalgam’s main market, near a pristine stream, heaps of garbage, including plastic and polythene, is smouldering continuously. Ironically, this stream-side works as a temporary garbage dumping site. As one drives past it, a strong stench – usually a mix of burning plastic, polythene, dead animal meat, and cardboard, fills one’s nostrils. Pahalgam generates 16.82 metric tons (12.89 commercial and 03.93 residential) of waste per day, during the peak tourist season. This is apart from monthly 12 metric tons of waste that are gathered after sweeping Pahalgam streets. 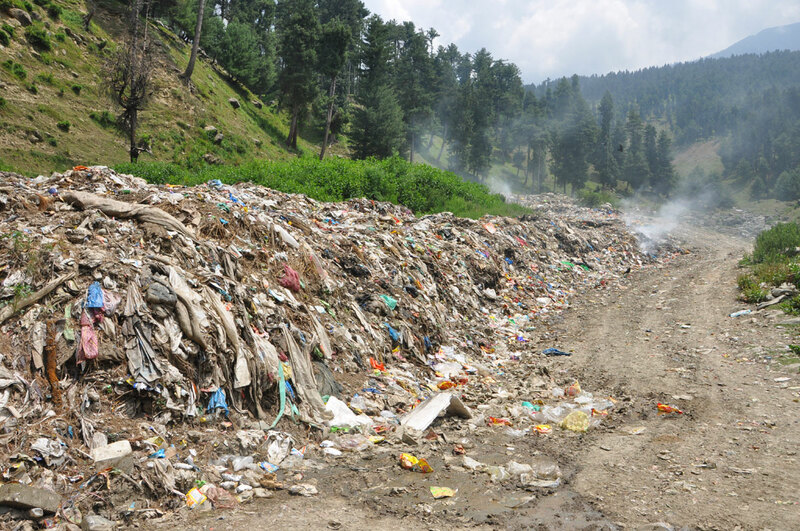 “This waste is dumped untreated at the disposal site because of a shortage of equipment and manpower,” said a Pahalgam Development Authority (PDA), the official who wished not to be named. As peak tourist season and two months long annual Amarnath Yatra go on simultaneously, the pressure on Pahalgam’s fragile ecology is huge. “During Yatra season, the collection of waste increases manifolds,” said a municipal worker. During Yatra, an extra of 7.5 metric tons (from Chandanwari) and 3 metric tons (Nunwan), of waste is generated. This waste mostly includes polythene, plastic, cardboard, and plastic wrapping. “We are trying our best to keep this place clean,” said Sarfaraz Ahmad, Executive Officer, Pahalgam Municipal Committee (PMC). But a large volume of waste, which yatris (pilgrims) dump on way to Amarnath Shrine, located deep into the mountains, stays there until fresh snowfall buries it completely. Recently, PMC constructed Sarbal Garbage Treatment Plant, which can disintegrate 1 metric ton waste per day, besides a capacity of 5 metric ton of segregation and composter. Once a beautiful virgin meadow Sonmarg is now dotted with hotels, huts, restaurants and other commercial buildings. Interestingly, most of these concrete structures are located on the fragile banks of River Sindh. With lack of proper waste management system, most of the waste generated by these commercial establishments end up in the river. Apart from turning Sonmarg into a brick and cement jungle, the forests and glaciers around the once beautiful meadows, now have a high concentration of plastic and polythene. Rai says there were a few hoteliers who would dump waste in the River Sindh earlier, but that practice is over now. “We are regularly monitoring such activities and whenever we find anyone violating norms, we send a notice and take action,” said Rai. = But the crisis is visible in Srinagar’s Dal Lake, the main tourist belt of Kashmir. At sunrise, the lake looks like a picture perfect location straight out of a fairy tale. But once you move a bit closer and take a look, the tale ends like a heartbreak. With around 550 houseboats with around 1700 rooms, the quantum of waste generated daily inside the lake is huge. Dumping site outside Pahalgam health resort. As most of the houseboats lack proper waste collection and disposal mechanism, the waste generated by tourists mostly ends up in the water body. “Even we feel bad for Dal Lake, but we have no other option,” said Dar.